Includes lunch. Please book your place in advance. A fun and friendly group for those learning the D/G melodeon. This once-a-month group is led by Ed Rennie, offering group tuition and encouragement. The price includes lunch (1pm). Friday 20 July. Autumn dates to follow. Ed usually has boxes available to borrow by prior arrangement – contact him on 01363 774426 if you wish to borrow a box, or to discuss whether this group is for you. Our Improvers group has been running since March 2016. We have been playing a variety of musical styles and rhythms, working across both rows, and playing left hand basses and chords. Out Beginners group began in September 2017 and are making great progress! They are putting both hands together, and starting to cross the rows. Fridays (11am-1pm, followed by lunch): 9 Feb, 9 March, 6 April, 11 May 8 June and 20 July. These are for people who’ve never even picked-up a melodeon before, but bear in mind that if you’re thinking of joining this group later in the term, you will need prior experience! A founder member of the Devon Squeezebox Foundation, Ed Rennie is passionate about helping people get started – and keep going! 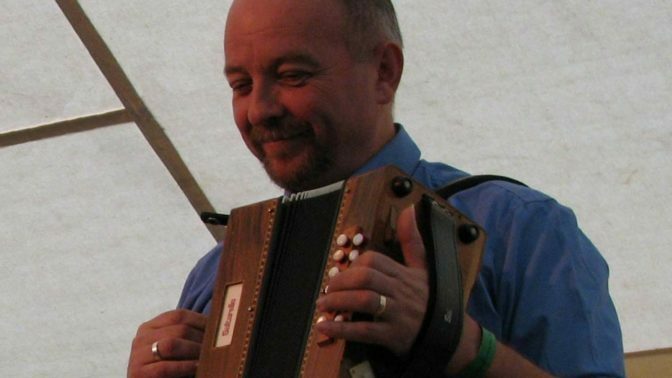 He recently published a book and CD ‘The Melodeon Tutor’, a step-by-step approach to unravel the mysteries of the D/G melodeon, and he runs beginners workshops at venues and festivals. For a long time best known as the melodeon player in The Bismarcks, Ed is also a fine singer, and plays bass for the Dartmoor Pixie Band.